SABARMATI ASHRAM: Top Gandhians nearly lost their composure as they heard of luxury-pen maker Mo’Bling’s plans to sell a Mahatma pen for a whopping 17,000 Euros. Recovering quickly, the Gandhians tendered an unconditional apology to Mo’Bling, expressing regret for thinking slightly violent thoughts about the company. Mo’Bling is however keen to keep the Gandhians pacified. 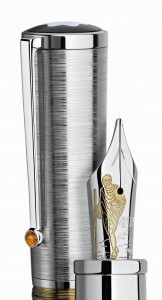 As a goodwill gesture, the company will recreate Gandhi’s epochal 1930 walk by having the 241 owners of the limited-edition pens take out a dandy march. Meanwhile, the first Gandhi pen has already been misplaced at an SBI Branch in Kannur. The disconsolate victim said: “as usual, some guy borrowed it to fill in his DD and I forgot all about it.” The entire branch observed a two-minute silence to mark the occasion.